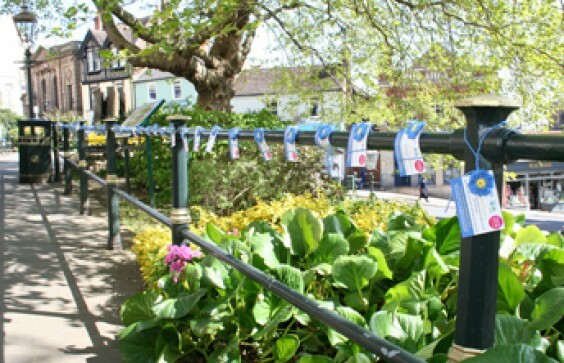 Burcot Grange Care Home, a member of the Bromsgrove and Redditch “dementia-friendly communities” programme, is asking people to knit or crochet forget-me-not flowers to be placed around the towns to mark Dementia Action Week in May. The flowers will also feature small messages and can be picked up by anyone. Flowers should be delivered to Burcot Grange Care Home, Chandler Court Care Home, Bromsgrove Library or Redditch Library by the end of April, ready for Dementia Action Week which starts on May 20. Yarn and Needles – It doesn’t really matter what yarn you use. You can play with whatever is leftover in your stash. Just make sure to use the suggested needle size for your yarn and you’ll be good to go (if you knit on the tight side, I’d suggest going one needle size up)! Depending on the weight, one flower requires 2 to 3 yards of blue yarn for the petals and 1 yard of similar or lighter weight yarn in yellow for the centre. Knit Flower: There is only one row to this flower after you have cast on. Cut your yarn 8” long. Thread the 8” tail through a tapestry needle and pull that needle through each of the remaining 10 stitches on your needle. Secure tail and shape flower. Sew in ends. Add yellow centre using any embroidery stitch you like to make a five-part yellow centre. Satin stitch works well, or daisy stitch or French knots. Sew in ends. Yarn and hook: Depending on the weight, one flower requires 3 to 4 yards of blue yarn for the petals and 1 yard of similar or lighter weight yarn in yellow for the centre. This will give you enough for the long tail for bookmarks. Use the hook size suggested on the yarn label for the weight of yarn you have. Used terms: chain (ch), slip stitch (sl st.), treble (triple) crochet (tr), single crochet (sc).